Vascular structures – cite! Vascular structures (message) Vascular structures – participate! Blood vesselsare the part of the circulatory system, and microcirculation, that transports blood throughout the human bodyThis glossary term has not yet been described. are critical to the survival and growth of cells and tissues. The rate of growth and ultimate tumor size, whether benignis any condition that is harmless in the long run or malignantThis glossary term has not yet been described., is governed at least in part by the tumor’s ability to derive ample blood flow to support the metabolic demands of its cells. Therefore, tumors may manifest signs of an increase in blood vesselsare the part of the circulatory system, and microcirculation, that transports blood throughout the human bodyThis glossary term has not yet been described. 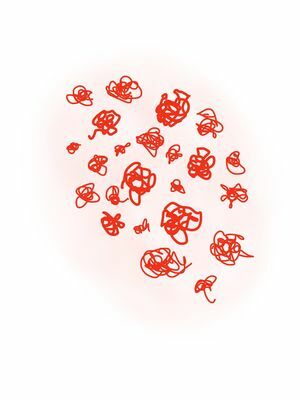 and flow. This is readily observed in many basal cell carcinomas (BCCs) in which the clinical morphologyThis glossary term has not yet been described. often reveals telangiectasias. Although other tumors may not clinically manifest vasculature, vesselsThis glossary term has not yet been described. are indeed present but may be of small caliber or situated deeper within the skinThis glossary term has not yet been described.. DermoscopyThe examination of [skin lesions] with a 'dermatoscope'. This traditionally consists of a magnifier (typically x10), a non-polarised light source, a transparent plate and a liquid medium between the instrument and the skin, and allows inspection of skin lesions unobstructed by skin surface reflections. Modern dermatoscopes dispense with the use of liquid medium and instead use polarised light to cancel out skin surface reflections., by providing magnification and visual access to subepidermal structuresThis glossary term has not yet been described., has per- mitted clinicians to observe many of these vessels. The skin receives vascular sup- ply through superficialThis glossary term has not yet been described. and deep vascular plexuses in the dermis (Fig. 12.1). These plexuses constitute anatomic landmarks in skin histologyThis glossary term has not yet been described.—the superficial vascular plexus marks the junction between the papillary and reticular dermis, whereas the deep vascular plexus separates the reticular dermis from subcutaneous fat (Lever). 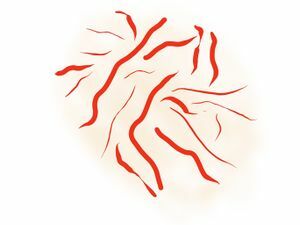 The superficial plexus is made up of anastomosing small-caliber arterioles that branch into capillaries, which extend into dermal papillae to sup- ply the overlying epidermis, as well as envelop adnexal structures. The deep plexus is made up of medium-caliber vessels, which emanate from larger vessels that traverse the adipose septae of the subcutis. Addition- ally, the deep plexus connects with the superficial vascular plexus through vertically oriented vessels. The architecture and distribution of vascu- lar structures, determined in part by neoangiogenic factors, angiogenic inhibitors, and tumor–stromal interactions, differ with tumor type. 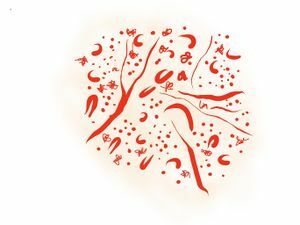 Oncogene activation in tumors drives angiogenesis by the expression of angiogenic factors, such as vascular endothelial growth factor (VEGF) and by inhibiting antiangiogenic factors, such as thrombospondin-1. Fibroblasts and endothelial cells are among the many stromal cells involved in the metastatic process, especially those adjacent to the tumor, that is, on the “tumor front.” The tumor microenvironment refers to tumor cells themselves and the surrounding stromal cells and components, such as cytokines, chemokines, collagen, elastin, and growth factors. The interaction of all microenvironment components play an important role in tumor growth and progression. For example, melanomaThis glossary term has not yet been described. cells interact with the stroma by way of cytokines, growth factors, and direct cell–cell contact. MelanomaThis glossary term has not yet been described. cells release autocrine growth factors, which stimulate proliferation of melanoma cells, as well as paracrine growth factors, including VEGF and platelet-derived growth factor (PDGF), which are involved in angiogenesis and invasion. VEGF has been detected in vertical growth phase melanoma and melanoma metastases, in contrast to benign melanocyticThis glossary term has not yet been described. lesions that show no immunoreactivity for VEGF. Appropriate dermoscopic technique for the visualization of vascular structuresThis glossary term has not yet been described. : Care must be exercised to insure that blood vessels, if present, are adequately visualized using dermoscopyThe examination of [skin lesions] with a 'dermatoscope'. This traditionally consists of a magnifier (typically x10), a non-polarised light source, a transparent plate and a liquid medium between the instrument and the skin, and allows inspection of skin lesions unobstructed by skin surface reflections. Modern dermatoscopes dispense with the use of liquid medium and instead use polarised light to cancel out skin surface reflections.. Cutaneous blood vessels can readily be blanched by even slight pressure on the skin surface. Thus, non- polarized dermoscopy utilizing alcohol as the fluid interface, where the glass plate of the dermoscope is pressed firmly against the skin surface, has the tendency to blanch out much of the cutaneous vasculature. To prevent this blanching effect, it is advised that the fluid interface (oil or alcohol) be replaced with ultrasound gel. The high viscosity of gel allows one to place the dermoscope onto the lesion with minimal pressure while maintaining full contact between the glass plate and the skin. Fortunately, polarized noncontact dermoscopes have eliminated the need for direct contact between the glass plate and skin, thereby eliminating the need for a liquid interface. Utilizing noncontact polarized dermoscopy has given us the ability to not only observe blood vessels, but also to indirectly assess the vascular volume within skin lesions. An increased vascular volume can be appreciated as a vascular blush (milky red area, pink veil). TerminologyThe system of terms belonging or peculiar to a science, art or specialized subject / nomenclature. Arborizing vesselsanalytic term is branched vessels; Bright red sharply in focus large or thick diameter vessels dividing into smaller vessels; BCC appear under dermoscopy as bright red, thick diameter vessels (0.2 mm or more) from which emanate branching vessels with progressively thinner diameters. 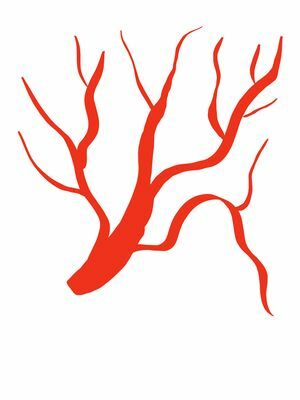 The arborizing vesselsanalytic term is branched vessels; Bright red sharply in focus large or thick diameter vessels dividing into smaller vessels; BCC are sharply in focus due to their superficial location, situated slightly below the epidermis, and exhibit irregular branching into fine terminal capillaries of small diameter (10 μm). These “tree-like vessels” are present in more than 80% of BCCs, yielding a positive predictive value (PPV) of 94%, and sensitivityThis glossary term has not yet been described. and specificityThis glossary term has not yet been described. of 96.1% and 90.9%, respectively. Adnexal tumors can sometimes appear similar to BCCs and may display arborizing vessels. Although uncommon, arborizing vessels may be seen in benign lesions, such as fibrous papules, intradermal neviThis glossary term has not yet been described., and epidermoid cysts; however, in these lesions the vessels are usually not in sharp focus. In addition, arborizing vessels can, on rare occasions, be seen in invasive cancers, including melanoma and Merkel cell carcinoma. There are several histologic variants of BCCAbbreviation for Basal Cell Carcinoma, including nodularThis glossary term has not yet been described., superficial, and infiltrative. Each of these BCC subtypes can present as amela- notic lesions or they can present with pigment. BCCs that are amelanotic can be identified based on the presence of arborizing vessels, shiny white areasThis glossary term has not yet been described., crystalline structures, and/or ulceration. Pigmented BCCs (pBCC), which may clinically mimic melanoma, contain specific dermoscopic structuresThis glossary term has not yet been described. that aid in their proper diagnosisis the identification of the nature and cause of a certain phenomenon. Diagnosis is used in many different disciplines with variations in the use of logic, analytics, and experience to determine "cause and effect". In systems engineering and computer science, it is typically used to determine the causes of symptoms, mitigations, and solutions. Menzies model for dermoscopic diagnosis of pBCCs (sensitivity of 93% and specificity of 89–92%) includes arborizing vessels as an important diagnostic feature. Arborizing vessels were observed in 52% of pBCCs, compared with 23% of melanomas and only 8% of benign skin lesions. While arborizing vessels are often quite prominent in nodular BCC, they tend to be less conspicuous in superficial BCCs (sBCC) and in fibroepithelioma of Pinkus, a rare BCC subtype. 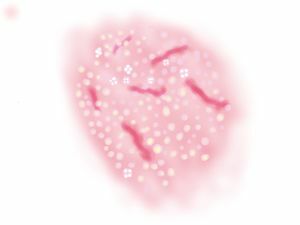 In sBCC it is common to see short fine telangiectasias, which are sharply in focus and arranged irregularly throughout the lesion. Additional presence of shiny white-to-red areas and multiple small ulcer- ations or erosions can provide reassurance that the lesion under investigation is a superficial BCC. These fine arborizing vessels, which are described as smaller in diameter than typical arborizing vessels and with less branching, have also been noted in fibroepithelioma of Pinkus. In addition, Pinkus tumors are often accompanied by dotted vesselstiny pinpoint vessels at the lesion’s periphery. Hairpin vessels are characterized by vessels that resemble hairpins, consisting of a U-shape with a sharp bend at one end. These looped hairpin vessels can appear distorted when the hairpin configuration twists around its own axis. 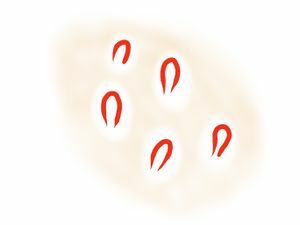 Hairpin vessels are found in melanocytic and nonmelanocyticThis glossary term has not yet been described. tumors. Relatively thin, uniform hairpin vessels are often seen in keratinizing tumors, such as seborrheic keratosesThis glossary term has not yet been described. (SKs). In these benign keratinizing tumors, a whitish halo often surrounds the vessels. This whitish halo probably represents viable tumor keratinocytes surrounding the dermal papilla, which contains the hairpin vessel. In a study of pigmented SKs, hairpin vessels were seen in 63% of lesions; more specifically, these vessels were seen in 50% of plaque-type SKs and 43% of papular/nodular SKs but were only seen in 6% of patch type SKs (Braun et al., 2002). In another study looking at lesions with vascular dermoThis glossary term has not yet been described.- scopic structures, 51.2% of SKs contained hairpin vessels, conferring a PPV of 70%. In keratoacanthomas, hairpin vessels are located peripherally, with a yellow keratotic center. In contrast, hairpin vessels in melanomas are often sur- rounded by a pink halo. Hairpin vessels may also be observed in wartsThis glossary term has not yet been described., SCCs, BCCs, dermal neviThis glossary term has not yet been described., and Spitz neviThis glossary term has not yet been described.. 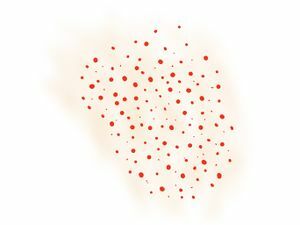 Dotted vesselstiny pinpoint vessels appear as small red dots with a diameter of 0.01–0.02 mm, and they represent vessels aligned perpendicular to the skin surface. They can be seen in inflamed skin, traumatized skin, or in skin overlying stasis. However, they can also be seen in cutaneous tumors. The presence of dotted vessels often implies that a lesion is melanocytic; in one study, 90% of the lesions with dotted vessels were melanocytic. In melanocytic tumors, dotted vessels confer a PPV of 38% for melanoma, 16% for dermal/congenital neviis a type of melanocytic nevus (or mole) found in infants at birth. This type of birthmark occurs in an estimated 1% of infants worldwide; it is located in the area of the head and neck 15% of the time., 21% for Clark neviThis glossary term has not yet been described., and 16% for Spitz nevi. In benign nevi, dotted vessels correspond to vessels at the tips of the dermal papillae and dermoscopically often appear to be situated within the holes of the pigment networkGrid-like pattern consisting of interconnecting pigmented lines surrounding hypopigmented holes.. In melanoma, dotted vessels, which are frequently found in conjunction with other vessel types, can be seen anywhere within the lesion but tend to be present at a higher concentration toward the center of the lesion. In a study of amelanotic and hypomelanotic melanomas (AHMamelanotic/hypomelanotic melanoma), dotted vessels were more commonly seen in melanomas 1mm in thickness (27.6%) when compared with those 1 mm in thickness (20.0%); when evaluating purely amelanotic melanomas, dotted vessels were seen in 60% of cases (Fig. 12.9). In another study, Bono and colleagues reported the presence of dotted vessels in 100% of thin amelanotic mela- nomas (1mm) (n = 9). The aforementioned data suggests that dotted vessels may be one of the first morphologic types of neoangiogenic vessels visible in melanoma because they appear to be more prevalent in thinner tumors. In a study analyzing amelanotic/hypomelanotic benign melanocytic lesions (AHBML) and amelanotic/hypomelanotic nonmelanocytic lesions (AHNML) (tumors), dotted vessels were observed in 32.7% and 21.8% of lesions, respectively. In nonmelanocytic lesions, dotted vessels are commonly seen in psoriasisThis glossary term has not yet been described., clear cell acanthomas (CCA), and squamous cell carcinomaThis glossary term has not yet been described. (SCCSquamous cell carcinoma). The distribution and arrangementThis glossary term has not yet been described. of dotted vessels within the aforementioned lesions can be very helpful in diagnosis. Dotted vessels in psoriasis are relatively uniform in size and are distributed homogenously throughout the plaque. When dotted vessels are arranged in a “string of pearlsCoiled or dotted vessels arranged in lines clear cell acanthoma” or serpiginous distribution, then the diagnosis of CCA is almost certain. Dotted vessels present focally at the periphery or throughout the entire lesion and in association with adherent scale is suggestive of SCC. Milky red globulesThis glossary term has not yet been described. 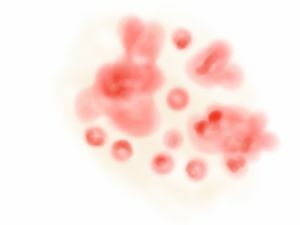 are, as their name suggests, globules with a milky red- dish coloring. These vascular structures may be observed within or near areas with a milky red colorColor (American English) or colour (Commonwealth English) is the characteristic of human visual perception described through color categories, with names such as red, yellow, purple, or blue.. Although milky red globulesThis glossary term has not yet been described. are not seen frequently, when present, they are highly suggestive of invasive melanoma. They may be valuable in the recognition of thicker AHM, which often do not have many noticeable or identifying features. In AHM, milky red globules/red areas were reported in 31% of thin melanomas (1mm) and in 93.3% of thick melanomas (1mm), as compared with 17.3% and 9.1% of AHBML and AHNML, respectively. In another study, 4.7% of melanomas with vascular structures on dermoscopy contained milky red globules/areas, correlating with a PPV of 77.8%; only 0.5% of nonmelanoma lesions had these structures. Vascular blush, also known as erythematous blush, pink veil, or milky red areasMilky-white appearance or pinkish structureless areas ("strawberry and ice cream"-like), consisting a red vascular blush with no specific distinguishable vessels, represents a red or pink region that corresponds to an area with increased vascularity. Thus, vascular blush can be seen in lesions, such as dermatofibromas, vascular tumors, such as pyogenic granulomas, inflammatoryThis glossary term has not yet been described. lesions, and both melanoma and nonmelanoma skin cancers. Although vascular blush can be seen in nevi, it tends to be more common and conspicuous in melanoma. Glomerular vesselsThis glossary term has not yet been described. 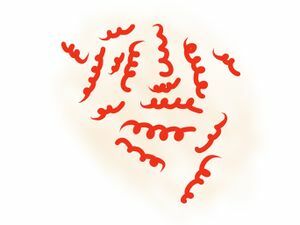 are the dermoscopic manifestations of tortuous, dilated capillaries. They are named as such because their morphology is reminiscent of the convoluted capillaries that comprise the glomerular apparatus of the kidney. Glomerular vessels are larger than dotted vessels and can be positioned in clusters throughout the lesion. Histologically these vessels correlate to dilated capillaries in the dermal papillae and papillary dermis (Felder et al., 2006). Most commonly, glomerular vesselsThis glossary term has not yet been described. are associated with SCCs, in which the glomerular vessels are prin- cipally distributed focally in clusters and at the periphery of the lesion together with hyperkeratosis (i.e., scaly surface). In a study of Bowenalso known as squamous cell carcinoma in situ is a neoplastic skin disease. It can be considered as an early stage or intraepidermal form of squamous cell carcinoma. It was named after John T. Bowen’s disease (BD), 80% of pigmented BD and 100% of nonpigmented BD displayed glomerular vessels. In another study, glomerular vessels were seen in 81.2% of BD cases with a PPV of 61.9%. In contrast, glomerular vessels were seen in only 1.3% of melanomas, 12.2% of SKs, and 7.1% of invasive SCCs. Glomerular vessels can also be seen in CCA where the vessels will be arranged in a string of pearls distribution, in psoriasis where the vessels are distributed throughout the lesion in an organized pattern, and in stasis dermatitisalso known as eczema is a group of diseases that results in inflammation of the skin. where these vessels will be visible in normal appearing skin. Lastly, glomerular vessels can also be seen in melanoma, especially within metastatic foci. Comma vesselslinear curved short vessels dermal nevi are slightly curved vesselscomma vessels - linear curved short vessels - dermal nevi monomorphous vessels: one type of vessel dominates that appear to take the shape of a comma. These vessels tend to appear slightly out of focus, as their deeper location within the dermis does not allow for sharp visualization under dermoscopy. Comma vessels are most commonly associated with dermal nevi. In a study of dermal/ congenital nevi, 66.3% exhibited this vascular pattern, with a PPV of 94%. In another study, comma vesselslinear curved short vessels dermal nevi, when distributed in an organized fashion and when they comprise the predominant observed vessel morphology, are predictive that the lesion in question is not a melanoma. 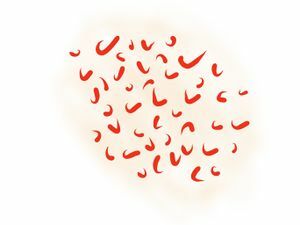 In other words, comma vessels are highly suggestive of benign nevi with dermal nevi being the most common, but they can also be seen in compound nevi. Serpentine vesselslinear irregular vessels with multiple bends. Seen with flat BCC and melanoma were previously termed linear irregularlinear vessels with multiple bends vessels are red vascular structures that come in a range of sizes and shapes. They can be identified in melanoma, BCCs, and dysplastic neviThis glossary term has not yet been described.. In one study, 33.3% of melanomas had these vessels, with a PPV of 67.6%. In another study of AHM, linear–irregular vessels were seen in 10.3% of thin AHM (1 mm), in 0% of thick AHM (1mm), and 0% in amelanotic/hypomelanotic benign melanocytic lesions. Thus, similar to dotted vessels, the presence of these vessels suggests that the melanoma is still relatively thin. Polymorphous vesselsmultiple types of vessels are present may indicate malignancy in appropriate context for example in flat melanocytic lesions are used to describe the vasculature of lesions in which two or more types of vessel morphologies are detected. The presence of polymorphous vesselsmultiple types of vessels are present may indicate malignancy in appropriate context for example in flat melanocytic lesions may suggest a diagnosis of melanoma. The most common combinationThis glossary term has not yet been described. of vessel types seen in melanoma is the presence of both dotted vessels and linear–irregular vessels. In a study of lesions with vascular features seen on dermoscopy, only 20% of the lesions contained polymorphous structures, which correlated with a PPV of 52.6% for melanoma. More specifically, the combination of dotted and linear–irregular vessels was found in 18% of AHM but only extremely rarely in other nonmelanoma amelanotic/hypomelanotic lesions (1.8% of AHNML and 0% of AHBML). Polymorphous vessels in combinations other than dotted vessels and linear–irregular vessels may be observed in cutaneous melanoma metastases. They can also be seen in papillomatous melanocytic nevi and other tumors, such as eccrine poromas. Corkscrew vesselstwisted looped vessels with bends twisted along a central axis melanoma metastasis appear as tightly coiled or tortuous vessels and have been observed in nodular melanomaThis glossary term has not yet been described., desmoplastic melanoma, and cutaneous melanoma metastases. vascular patternsThis glossary term has not yet been described. Crown vesselsRadial serpentine or arborizing vessels at the periphery of the lesion that radiate towards the center but do not cross the midline of the lesion. sebaceous hyperplasia comprise linear, curved vessels with minimal branching, situated along the periphery and extending toward the center without crossing it, giving the appearance of a crown. Crown vessels are characteristic of sebaceous hyperplasiaThis glossary term has not yet been described. ; this pattern was seen in 83.3% of sebaceous hyperplasia with a PPV of 83.3%. Crown vessels may also be seen in molluscum contagiosumThis glossary term has not yet been described.. The term “strawberry patternReddish pseudo-network (erythema and wavy fine vessels) around hair follicle openings which are accentuated with a white halo appearance” refers to the distinctive dermoscopic appearance of facial actinic keratoses, consisting of a pink/red pseudonetworkA structureless pigment area interrupted by non-pigmented adnexal openings with blurry vessels coursing between hair follicle openingsThis glossary term has not yet been described. filled with keratotic plugs. 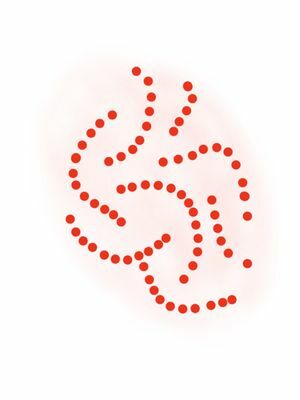 This pattern represents the unique appearance of dotted or glomerular vessels arranged in a serpiginous distribution that may appear like a “string of pearls.” This pattern is highly suggestive of a diagnosis of clear cell acanthoma(also known as "Acanthome cellules claires of Degos and Civatte," "Degos acanthoma," and "Pale cell acanthoma") is a benign clinical and histological lesion initially described as neoplastic, which some authors now regard as a reactive dermatosis. It usually presents as a moist solitary firm, brown-red, well-circumscribed, 5 mm to 2 cm nodule or plaque on the lower extremities of middle-aged to elderly individuals The lesion has a crusted, scaly peripheral collarette and vascular puncta on the surface. It is characterized by slow growth, and may persist for years. The clinical differential diagnosis includes: dermatofibroma, inflamed seborrheic keratosis, pyogenic granuloma, basal cell carcinoma, squamous cell carcinoma, verruca vulgaris, psoriatic plaque, and melanoma..
Follicular Red DotsDots are small, round structures of less than 0.1 mm in diameter that have a red color when corresponding to blood vessels; however, when due to melanin, their color ranges from black, brown, to blue-gray depending on the depth and concentration of the melanin in the skin (Tyndall effect). Another more recently described vascular feature is the pattern of follicular red dotsDots are small, round structures of less than 0.1 mm in diameter that have a red color when corresponding to blood vessels; however, when due to melanin, their color ranges from black, brown, to blue-gray depending on the depth and concentration of the melanin in the skin (Tyndall effect)., which have been described in active discoid lupus erythematosusis a chronic skin condition of sores with inflammation and scarring favouring the face, ears, and scalp and at times on other body areas. These lesions develop as a red, inflamed patch with a scaling and crusty appearance. The centre areas may appear lighter in colour with a rim darker than the normal skin.. 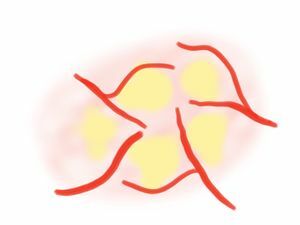 The follicular red dots are seen surrounding the hair follicle openings and consist of regularly distributed, concentric reddish dots in a region of alopecia. This may represent dilation of blood vessels with extravasation of red blood cells surrounding the widened infundibula. The recognition of vascular structures under dermoscopy has become increasingly important for a range of diagnoses. The identification of specific vascular characteristics is an important element of the two-step dermoscopic algorithmIn mathematics and computer science, an algorithm (Listeni/ˈælɡərɪðəm/ AL-gə-ri-dhəm) is a self-contained sequence of actions to be performed. Algorithms can perform calculation, data processing and automated reasoning tasks.. When the lesion is categorized as a nonmelanocytic lesion, vascular features can helpRefers to giving assistance or support to others for mutual benefit to diagnose the lesion more specifically, and hence guide managementThis glossary term has not yet been described. (Level 5 of the revised two-step dermoscopic algorithm). If the lesion is clearly recognized as a melanocytic tumor, then the identification of vessel type and distribution may facilitate the differentiation between benign and malignant diagnoses (Level 6 of the revised two-step dermoscopic algorithm). For more ambiguous cases in which the lesion cannot be easily classified as melanocytic or nonmelanocytic, the clinician may need to rely on vascular structures as the only recognizable features that can assist in the diagnosis. In conclusion, it has become apparent that a finite number of morphologically distinct blood vessels can be visualized under dermoscopy. The vessel morphology and distribution along with other accompanying features can assist the clinician in correctly identifying many benign and malignant lesions. In general, vessels in melanocytic lesions include dotted vessels, comma vessels, linear irregular vessels/serpentine vesselslinear irregular vessels with multiple bends. Seen with flat BCC and melanoma, milky red globules, vascular blush, and polymorphous vessels. Vessels suggestive of nonmelanocytic lesions include arborizing vessels, hairpin vessels, glomerular vessels, crown vesselsRadial serpentine or arborizing vessels at the periphery of the lesion that radiate towards the center but do not cross the midline of the lesion. sebaceous hyperplasia, and dotted vessels in a string of pearls pattern.